From June, 2017, Hoshino Coffee Shop has been serving pancakes, Uji Kintoki Souffle Pancakes for a limited time. We mixed Uji Mathca into the batter and the pancakes have rich matcha flavor. 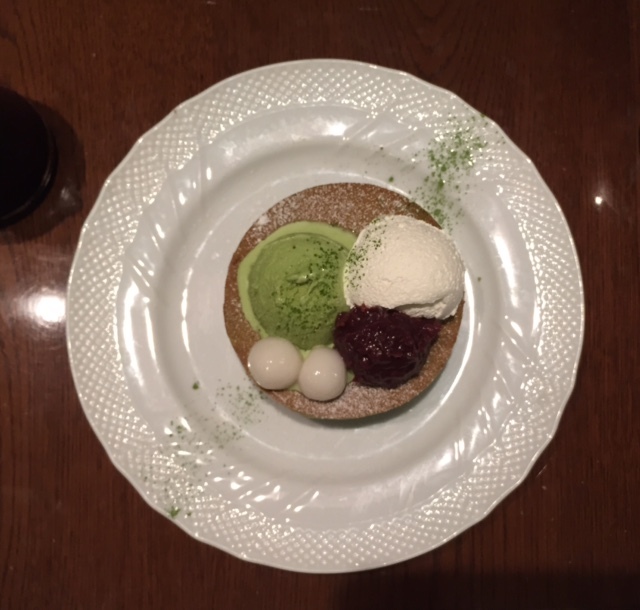 The pancakes are topped with matcha ice cream, and please enjoy the full of matcha flavored pancakes. They use matcha from Kamitsujien, a long-established business specialized in tea in Kyoto. Same as other souffle pancakes, they bake the pancakes in the oven to order and it's ready in about 20 minutes. Over the pancake, there're matcha ice cream, 2 dumplings, red bean jam and cream. 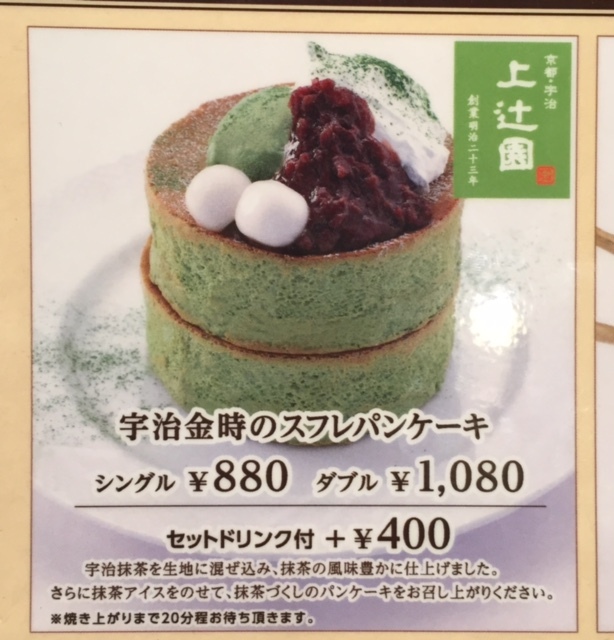 On the plate, there's a line of matcha powder. The pancake was dusted with white powder sugar. The pancake had beautiful matcha color, and it's light-crispy on the outside and moist inside, and it's sweet and had subtle matcha scent. Matcha ice cream had more vivid and stronger matcha flavor with bitterness. Dumpling were soft and chewy. Red bean jam was quite sweet and I didn't use the syrup that was served. The white dome tasted like firm peak whipped cream. Other reviews of Hoshino Coffee Shop.